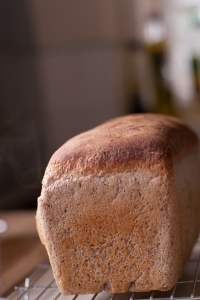 The Prudent Life: Dust Off Your Bread Machine and Use It! Dust Off Your Bread Machine and Use It! Years ago, bread machines were all the rage. It was the latest, greatest thing and many people rushed out to buy their own. But then we got tired of the funny-shaped loaves with the hole in the middle and put them in storage or took them to Good Will. Well, if you still have yours, I would like to recommend you take it out of storage, dust it off, and put it to good use! Have you ever looked at the ingredient list on a loaf of commercially made bread? The list always includes many unfamiliar items we would never find in our own kitchens, including sweeteners and preservatives. You are probably thinking, "I know that is true but making bread takes so much time..." Yes, you are right, it does! But not with your bread machine. Your bread machine makes light work of all of the kneading and rising time. Sometimes I program the machine to bake the loaf right there. I have fabulous recipes for honey wheat and oatmeal breads. But if you don't like the shape of your bread machine loaves, then set it to the dough cycle. This makes light work of homemade dinner rolls, sandwich buns, and cinnamon rolls. No matter how I use it, I know that I am feeding my family bread without all of the unnecessary items that are found in commercially made bread. *My bread machine is a "Regal Breadmaker". It has been very reliable for many years now.